Q: I want to start my own journal and release it into the BookMooch world. What do I do? Author: This field can say something like “BMJournalers” or “BookMoochers.” Or it can say your name. Title: Please start your title with BMJournal and follow that with your journal’s unique name. Adding BMJournal at the beginning of your title will help your journal show up in search results. Description: Use the description field when adding your journal to the system to explain your topic or theme and what you’d like done to the journal. Also, be sure to add your BookMooch ID to the description so participants may contact you. In the condition notes add the weight of the journal, especially if this may deter some journallers from passing the journal on. If it is added here it can be amended as extra material is added to the journal. Wishlist your own journal when you send it out (and again if you mooch it back, when it is resent) – this will enable you to keep track of where it is and if it has got stalled. Q: I have an idea for a new journal but I’m not sure if there is already a journal circulating with the same theme or topic. How can I find out? A: One way to tell is to go to the list of journals and search for a key word. For example, if you search using the word “fairy,” you’ll see several results. This does not mean you can’t duplicate a theme or topic. The journal will ultimately reside with the person who started it and there are always new journalers joining the project, too. So it’s okay to start a journal with a similar theme. However, your journal’s name should be unique. Give it a different name so it doesn’t get confused with another journal. Q: I’ve received a journal, added my entry and am now ready to pass it to someone else. How do I add the journal back into circulation? A: You want to re-list the journal into the BookMooch system using the original entry created by the journal’s owner. There are several ways to relist journals on their original page. Go to Member Home, Books Received, find the record of you having mooched and received the journal, click on the link for the journal and use the “Give My Copy” button. This sends out a message to folks who have the journal wishlisted. Another way to find it is to go to Advanced Search. In the “Search for these words:” box, type BMJournal. Before you hit the search button, go down to the button called “Search wishlists.” Use the drop-down to select “Yes, search all books.” Then click on “Search.” This will give you a results list of all the books with BMJournal in the title. (Note some journals are listed BM Journal with the space, so you can try it that way, too.) Find the journal entry and use the “Give my copy” button to add it to your inventory. A third way to find the original page: Go to the BM Journal Project web site at https://bookmoochjournals.com/ In the search box, type enough details from the title to find the journal. In the journal’s description, click on the link that takes you to the entry on BookMooch. Use the “Give my copy” button. Q: I’m ready to pass a journal on to someone else and it’s been promised to someone specifically. Shouldn’t I use an angel listing or make a new entry on BookMooch so someone else doesn’t mooch it before the person I promised it can get it? A: No. Each journal should have only one entry in the BookMooch system. The entry is the only way to track the journal and it’s important to be able to tell where the journal is. Please re-list the journal on the original page and use the “Reserve For” option. Q: How do I get my journal or pictures added to this site? A: Email the info, including a link to the journal’s entry on BookMooch, to bmjournals at gmail dot com. Pictures are resized so that the longer side is not more than 500 pixels. Q: I’ve just marked a journal lost. Is there anything else I should do? A: If a journal is marked lost, please contact the owner and let them know. Also, there is a “not traveling” tag on this site that will be used to identify journals that were lost or have been removed from circulation. Please email to advise if a journal’s status should be changed on this site. 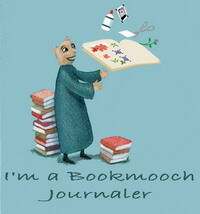 Q: How do I add a Bookmooch Journals badge to my blog or profile? Q: Who should I contact about this web site? or contact your local shelf – shelves and their areas are listed in the bmjl bio.